Names are an important type of vocabulary. Any native speaker of English can hear a name like “Stephanie” or “Tom” or “Catherine” or “John” and instantly recognize it as a name. Knowing that a word is a name can, of course, have an important impact on listening comprehension. In Chinese, it’s not the given names that draw from a general pool of “common names;” it’s the surnames. There is a relatively small number of surnames which the vast majority of the Chinese population uses. So knowing what the most common surnames are can come in extremely handy. 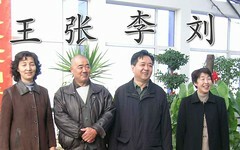 I recently discovered the website MingBa.cn (名霸), and among other name-related resources, it’s got a great page on Chinese surnames, apparently from the 百家姓. It has the top 100 at the top, followed by a huge alphabetical list of Chinese surnames, including all the obscure ones (along with pinyin!). 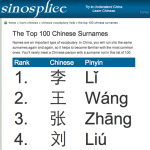 I didn’t like how the font was pretty small, and the top 100 didn’t have pinyin, so I created a vocabulary list for the top 100 on Sinosplice: The Top 100 Chinese Surnames. Enjoy the huge font. Thank you for posting this list, very handy to have although my bias wishes that there was a traditional characters column! It’s funny, I wouldn’t think that having a common first name (or last) name in English is any kind of cachet but my mother is really proud that her surname is one of the most common. She basically slagged my surname which does not appear in the top 100. Sorry, no traditional from me this time, but if you follow the Wikipedia link, it’s all there. That’s funny about the “surname slagging”… For me, it’s generally quite convenient that my surname is not at all common (unlike my given name!). Heh, was the huge font a dig at my comment on the last article? Honestly I don’t know how you fluent readers do it…I really have problems distinguishing ordinary-sized Chinese web fonts. Take the “ba” from Mingba.com above…it’s blurry. Too many strokes being drawn by too few pixels. I suppose once you know all the characters, you just recognize them immediately and don’t have to “read” them. If I get a chance this weekend, I’ll increase the font size in the other table too. Heh…is this an admission that you, like me, have trouble reading Chinese characters on the web unless they’ve been magnified? I imagine it isn’t too much trouble once you can read without thinking. But I, a mere mortal, must read each character carefully, looking at the strokes. Is this a “hump” that intermediate learners just need to get over? 百家姓 can read, no problem. Hundred family names. But 名霸? Name smear. Magnifying to 200%, I can see it’s rain something moon. But without the magnification I find it illegible. I suppose if you know the character already you can get the gist of it. Chinese people certainly don’t have any problems with the legibility of web fonts…probably because they recognize the characters immediately and don’t have to “read” them the same way foreign learners do. Ah, very useful indeed! I’m wondering if there are any sites that list the most frequently used “descriptions” of these common surnames, for example: 口天吴, 木子李, 沈阳的沈, etc. When people tell me their last names, they often follow it up with a clarification of which 汉字 it is. More often than not, I get a listening FAIL, and am too embarrassed to ask them to repeat themselves. Has anyone happened to run into such a resource? Coolness. I see they even have a good number of two-character names in there. My mom’s last name is Zhang! Mine’s is Zhong: 54th in ranking. I have a autobiography coming out so I need my ancestors names and stuff so I searched my surname and my mothers surname: And the Chinese popularity name ranking came out! It’s was so helpful! I can mention this in my auto-bio! !I bet my teacher will be impressed I did extra work on my reaserch!